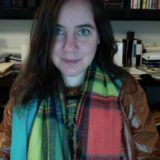 MC Hyland is a PhD candidate in English Literature at New York University, and holds MFAs in Poetry and Book Arts from the University of Alabama. From her research, she produces scholarly and poetic texts, artists’ books, and public art projects. She is the founding editor of DoubleCross Press, a poetry micropress, as well as the author of several poetry chapbooks (most recently THE END PART ONE from Magic Helicopter Press) and the poetry collection Neveragainland (Lowbrow Press, 2010). 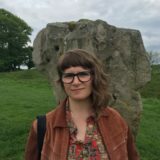 Anna Gurton-Wachter is a writer, editor, and archivist. Her first full length book, Utopia Pipe Dream Memory, is forthcoming from Ugly Duckling Presse in 2019. Chapbooks include Mother of All (Above/Ground Press), The Abundance Chamber Works Alone (Essay Press), Blank Blank Blues (Horse Less Press), and CYRUS (Portable Press @ Yo Yo Labs). Other work has appeared in PELT’s Feminist Temporalities, No Dear, 6×6, Elderly and elsewhere. Anna edits and makes books with DoubleCross Press. She lives in Brooklyn, NY a few blocks from the building in which she was born.